Think pull-ups are out of reach? Not true! Follow this 5-step progression & CONQUER them! Find a low bar 3-4 feet off the ground and slide your body carefully underneath it. 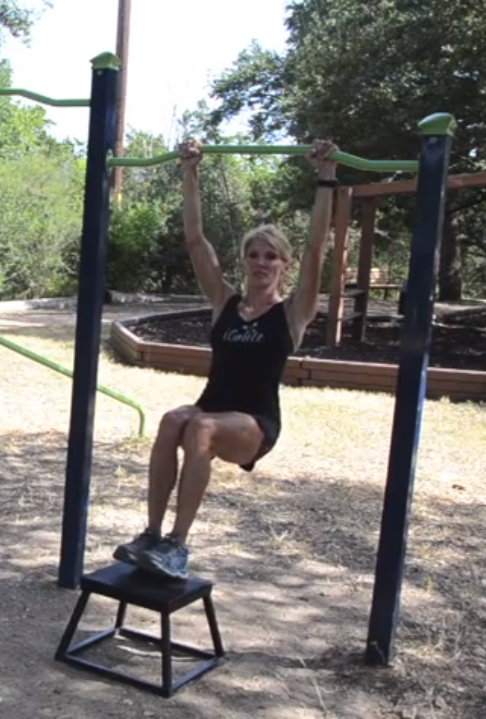 Grab the bar with an overhand grip, keeping the core tight and the body straight (no sagging). Keeping your shoulders away from the ears, engage your back muscles as you pull your chest up to the bar. Be sure to lower slowly to engage the back muscles. Work up to completing 10-15 reps comfortably before moving onto the next progression. At a low standing bar, place a stool/box/bench about one foot in front of the bar. 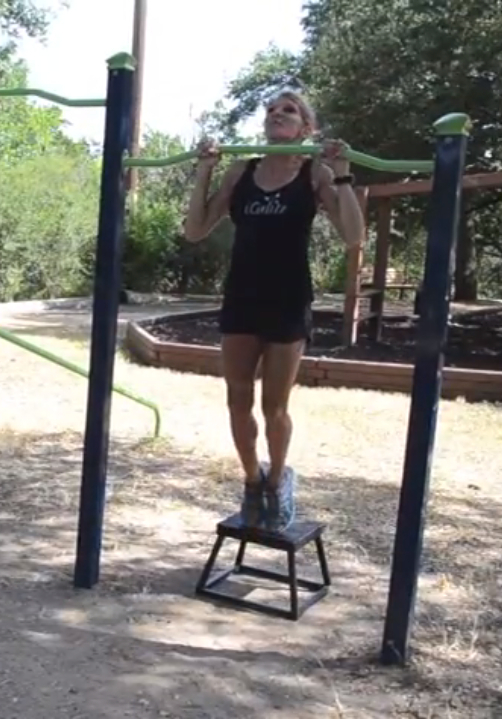 Grab the bar with your arms a little wider than shoulder width apart and with your thumbs underneath. Place the bench where when hanging from the bar your knees will be at 90 degrees, and place your heels on the bench. Slowly pull your chin up over the bar, pushing through the heels for assistance. Lower slowly down to engage the back muscles. Master 10-15 of these before moving on. Place your chair/bench 12 inches behind the bar, and hang down from the bar so that your knees are at a 90 degree angle and your toes are resting on the bench. Pull yourself up using your toes for assistance. Start with 5 reps and work up to 10 of these. At the same low standing bar (or at a high bar with a stool), jump up over the bar and slowly lower down. Work up to 10 of these. Focus on engaging your back muscles as you slowly lower down, keeping your shoulders away from your ears. Standing at the high pull-up bar with the grip wider than your shoulders, engage the core — don’t let the legs swing — and engage your back and pull your chin up over the bar. Do not lean your head back and strain your neck, instead, pull with your back muscles as hard as you can to get your chin up over the bar. You were not put on this earth to fit in, you were born to stand out! 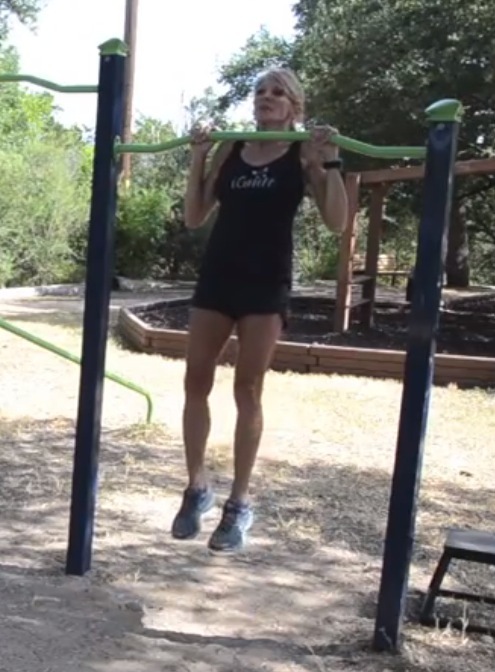 This entry was posted in Fitness, Videos We Love, Workouts and tagged austin, fitness, health, how-to video, ignite, ignite your life, Kathleen Parker, pull ups for women, pull-ups on August 28, 2014 by iGnite Your Life.